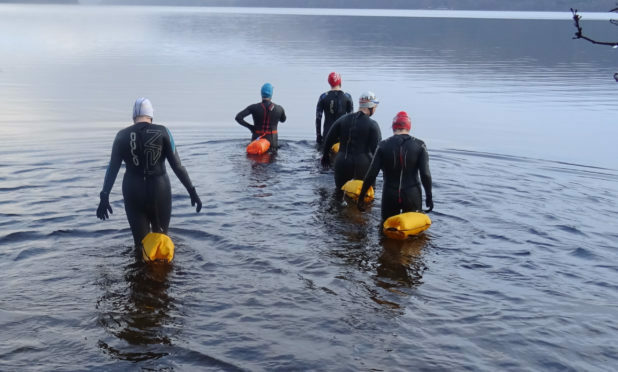 A group of Perthshire swimmers will battle Loch Tay in a brutal challenge to raise funds for the local community. Five avid swimmers will take on the length of the loch next weekend in a 12-hour mammoth event. The group from Killin are attempting to swim to Kenmore to raise money for a new post office and newsagents in their hometown. Liz Stevens, Helen Cole, Theresa Elliot, Ishbel Hayes and Angela Steel have been rigorously training for the last two years. Having trained in the loch three times a week, they will now take the ultimate challenge of swimming the length of the water. With the post office in Killin needing to find a new home, the swimmers realised their big swim would be a perfect to try to raise funds. Liz said: “A few of us started swimming in 2015 and slowly we started adding to the group and there is now five of us today ready to take on this challenge. “In the last two years we have been swimming 12 months of the year in all conditions. “We swim three times a week all year round. “We thought it would be a nice challenge to swim from our usual spot up to Kenmore. “We thought we would add it on as a fundraiser as we always have people telling us if they knew we were doing it they would send money for charity. “Also, there is a big project in the village by Killin Trust to buy a new property to house the post office and newsagent. The plunge is expected to take 12 hours, with each swimmer taking on 30-minute intervals. A lifeboat will follow the group on their quest and carry them in-between their swims. Once they reach Kenmore, the Taymouth Marina Hotel has offered the use of their HotBox, Scotland’s first lochside sauna. The group of five range in age from their 20s to 50s and Liz said locals have supported them — but are nevertheless labelling them as mad. She added: “It will be a very long day. “We will be swimming 30 minutes each, which in itself is not a huge amount but when you come out and watch someone else swim and have to go back in again later, that is quite a challenge in itself. “The conditions on the loch can change in seconds. “You can start off and it can be nice and calm and then a bit later it can be really rough so we need to prepare to swim in all conditions. To donate to the group visit uk.virginmoneygiving.com/LizStevens4.